Finally, fitness that’s focused on you. No time for the gym? No problem! Train one-on-one with Ashley Blake wherever your life takes you. Say goodbye to costly gym memberships + time wasted getting to the gym. Get the results you want with one of Philadelphia’s most in-demand fitness pros. No risk, cancel any time. A fitness solution for those wanting to tone, tighten + torch calories without compromising joint health. This time + joint saving system is ideal for the exercise enthusiast that wants their fitness on the fly. Workouts can be performed from the convenience of your home, hotel or office. Balance is the key to independence, longevity + the foundation for any successful fitness program. Designed to strengthen, stabilize + save you time + money from preventable fall-related injuries. 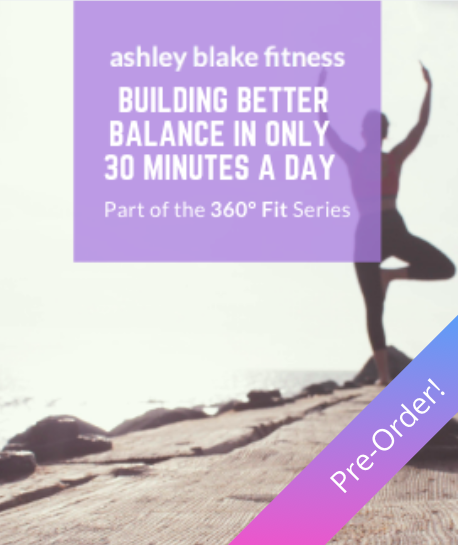 All you need is 30 minutes, this balance boosting ebook + a small space.